Lottie Cakes: Viva La Chile! You little wild monkey.. 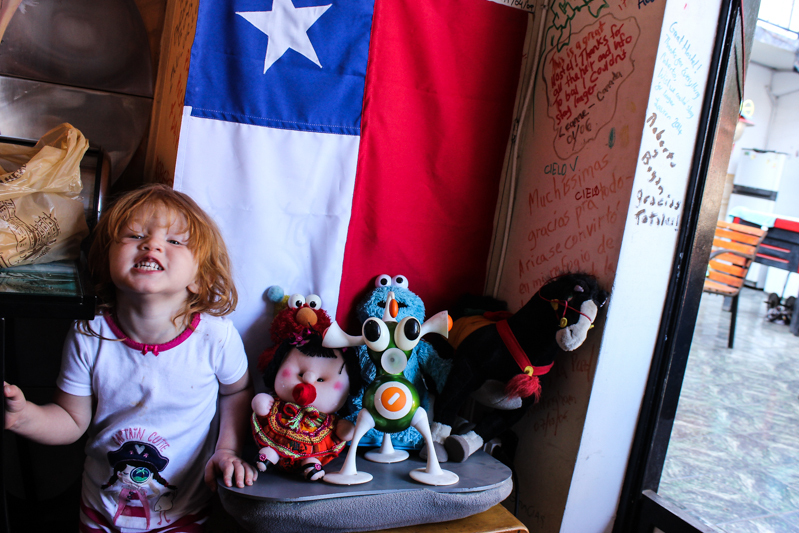 Here you are at our hostel in Chile, you put your baby doll next to the other creatures decorating the patio and begged your daddy to take you and your tiny friends photo as you cheesed at the camera. You've chased us through the streets of Arica, calling us cheeky butts, run nakey through the hostel as I ran two steps behind with your pj's, ate your weight in "pink" ice cream on the beach and charmed all the other travelers with your silly stories and funny ways. I envision you in a few years doing this all alone (hopefully sans the nakey part!!) and I am sad to think my young solo backpacker days are over but overjoyed to think of the fun you will have and the experiences you will already have behind you.